1.1 The AsIPA (Asian Integral Pastoral Approach) teams attending the Second General Assembly composed of 105 participants (36 lay, 12 religious, 49 priests and 8 bishops) from Bangladesh, India, Indonesia, Korea, Malaysia, Myanmar, the Philippines, Singapore, Sri Lanka, Taiwan, Thailand, East Timor and Papua New Guinea, had for its theme “A New Way of Being Church in the New Millennium,” which aimed to deepen our understanding of the AsIPA way towards becoming a Participatory Church – a Church that is a “Communion of Communities.” The dynamics of this gathering revolved around sharing of experiences, examining together AsIPA modules as well as attempts to organize structures for networking, coordination and exchanges in view of renewing local communities. The first step in this line, however, was taken during the first AsIPA General Assembly in 1996, which defined more clearly the integral pastoral approach for the renewal of local Churches suited to the Asian situation. 1.2 AsIPA II inaugurates the THIRD MILLENNIUM by re-affirming the mission of helping build the local Church “as a ‘Communion of Communities’ gathered around the Shepherd, where clergy, consecrated persons and the laity are engaged in a ‘dialogue of life and heart’ sustained by the grace of the Holy Spirit” (Ecclesia in Asia, 25). 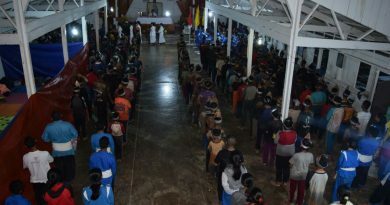 1.3 Looking back and evaluating on what AsIPA has helped to achieve, it rediscovers in its evangelization efforts the unique role of the Holy Spirits bringing out the life and love of the Father through Jesus Christ in the communion of faith amidst diversity of peoples and cultures in the local Churches of Asia. The Holy Spirit indeed “is the prime agent of evangelization,” (EA, 17). 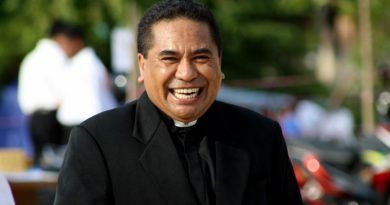 1.4 Concretely, the local Church is renewed when parishes within it are restructured into “a community of small communities.” The AsIPA methodology, which is declared by the Federation of Asian Bishops Conferences as “proving to be a very good help to the growth and development of BECs” become the central tool in bringing about this communion marked by authentic participation and co-responsibility (c.f. Final Statement of FABC 7, III.7.). 1.5 This AsIPA methodology facilitates the genuine participation of all, especially the least and the last, in the process of renewal. Through the centrality of the Word of God, the participants take an active part in the actual discovery of God’s message for them. As they look together at their life and their surroundings in the light of the Gospel, the Church in its smallest cell is vivified. 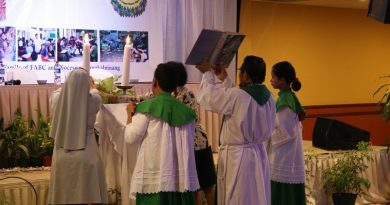 1.6 The Word of God and the celebration of Eucharist move SCCs to express their faith in Jesus through service of human promotion. This in turns build and strengthens a life of communion. Hence in the smallest cell of Church’s life there is an experience of “communion for mission” and the “mission of communion” (c.f. EA, 25). In an enriching environment of openness amidst cultural diversity, we celebrated the Eucharist with one heart and mind, and lived that unity during the entire duration of the Assembly. Centered around the Word of God through Gospel sharing and gaining deeper understanding of the teachings of the Church, we strengthened our faith in Christ. We have come to realize that the SCCs are a normal way of being one, holy, catholic and apostolic church in a miniature form in the neighbourhood. Here, all the members experience the presence of the Risen Lord by their sharing and caring. We have discovered as well, that initiating and maintaining SCCs is a gradual process and requires greater attention and nourishment in its initial stages of growth. We observed that more and more countries, dioceses and parishes today are making committed efforts to become a new way of being Church where all Christ’s faithful learn to live and work as sisters and brothers. In reaching towards this goal of participatory Church, a growing number of religious, laity, priests and bishops are beginning to see SCCs as one of the best ways. 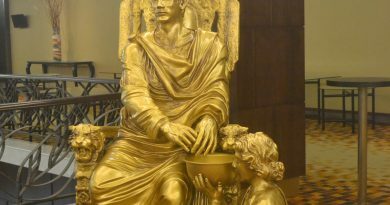 The Vatican Council II has reminded us that the family is the domestic church. The SCCs start revitalizing this basic cell so that as branches deeply incorporated in the Vine, they may bear much fruit. 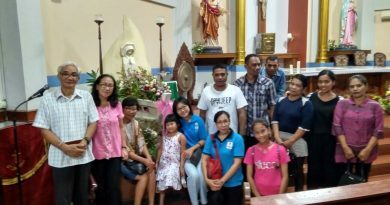 The SCCs provide the way to carry on the mission of Christ not only in the Chruch but also in the families, in the society and in the world at large. We have experienced that SCCs have become an effective means for proclamation through dialogue of life. In this context they explore the possibility of building human communities. 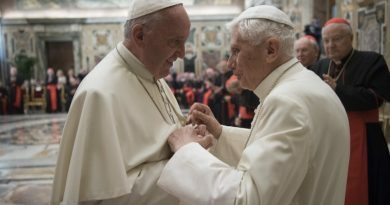 Thereby they pave the way for incarnation of the Church in the cultural milieu of the place, making it ever more relevant to the changing circumstances. Transformation of all the intricate systems and structures of the world by bringing them under the purview of the Kingdom, is made possible also through SCCs. community of co-responsible brothers and sisters in the mission of Christ. Presentation and evaluation of new training programmes prepared by various dioceses and countries in response to the local needs have created a deep sense of hope that we are empowered to respond to our own pastoral and social realities by developing new training programmes. In the process, we admit that many are facing difficulties and crosses. Sharing our experiences of achievements and struggles has given us a sense of solidarity and become a source of mutual encouragement. We envision that it is through SCCs that the Church begins to bloom in Asia. 3.1 SCCs as a seedbed of inculturation, rebirthing and recreating the local Church God revealed God’s self to us by joining us in our humanity and showing us the way to fullness of life. Thus, inculturation is a natural response to an enfleshed God. Through Small Christian Communities, Jesus the living Word, is being reborn, reinterpreted, incarnated as it were in the local context. Sharing of God’s Word, celebrating life’s joys and pains, reaching out and serving others, getting involved in life issues in one’s particular context, SCCs make Jesus alive and effective in our world. 3.2 SCCs as leaven for social and spiritual transformation and an agent of change Small though they are, SCCs, the church in the neighborhood, become a leaven for transformation. SCC’s lifestyle of prayer and reflection, solidarity and compassion, service and involvement at a local level serve as a leaven that makes life a little better in our world. Networking and action of SCCs in a parish setting therefore becomes a potent force for spiritual and societal change which expresses solidarity with the poor, weak and suffering. 3.3 Harmony in the midst of diversity. Diversity is a reality in our world. The specific contribution of the Asian church to the world church, with its many cultures, religions and races, is to be able to live in harmony with peoples of varied cultural, religious, economic and political backgrounds. Harmony, an Asian value, turns into an attitude and behavioral pattern as SCCs engage in dialogue of life with its diverse neighbours and work together for a common cause. 3.4 New style of leadership. story of growth. A new way of being Church needs a collaborative leadership. All pastoral leaders are called upon to actively involve and renew themselves through participation in the life of SCCs. Thereby they lean to effectively accompany this way of life. 4.1 We, the participants of the Second AsIPA General Assembly, encourage each other through an exchange of experiences and materials to carry on in our unique faith journey. Deeply rooted in the Word of God and Eucharist, we accompany one another in building and sustaining the Small Christian Communities responding to the call of the Asian bishops towards a new way of being Church. 4.2 We express solidarity with our brothers and sisters in neighboring dioceses and countries by sharing personnel and training programmes. 4.3 We encourage all Christ’s faithful to exercise their baptismal calling by becoming coresponsible participants in the Church’s mission, joining and being active in Small Christian Communities. 4.4 Inspired by the number of Asian bishops, who have walked on this journey of community building, we hope that all bishops of Asia will lead in a participatory way by immersing themselves in this process of renewing the Church at the grassroots level. 4.5 While we continue to collaborate with our pastoral leaders who are active in this process, we invite other bishops, priests, religious and laity in our home countries to grow deeper in the awareness of a participatory and co-responsible Church as the way to live out Vatican II’s vision of the Church as the People of God and as a concrete means of carrying out he mission of Christ in our local situation. 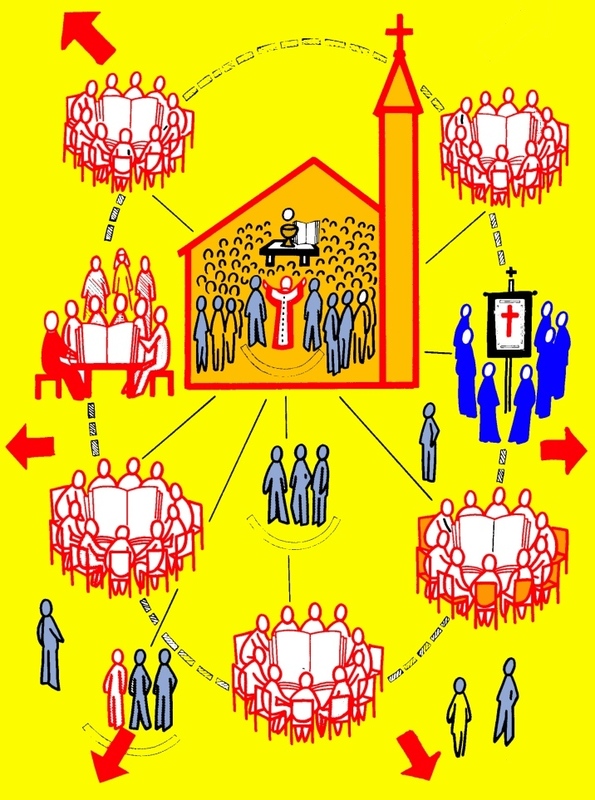 4.6 Since we envision SCCs as the basic structure for living out faith-life and mission, we call on the members of ecclesial movements and associations to discover their wider and fundamental role in the Small Christian Communities. 4.7 We encourage the use of different forms of communication to share the experiences of members of Small Christian Communities presenting more concretely the way of living as Church in the neighborhood and participating in Christ’s mission. 4.8 Finally, we recommend that a general assembly of diocesan and national teams be help once every 3 years to be a forum of exchange and deepening in our vision of the new way of being Church where all members are co-responsible and actively involved. 5.1 We experienced during these days of the General Assembly how truly blessed we are for being called and entrusted to carry out the mission of Christ with our SCCs. Our coming together to share our reflections, training sessions and daily celebration of inculturated liturgy has been a special source of joy and encouragement. We thank all the participants who contributed to make this an enriching experience of “communion of communities.” We wish to thank in particular, Bishop Oswald Hirmer who has accompanied us from the inception of the AsIPA and even during this Assembly. We have been recipient of the warm welcome of our Thai hosts and we are immensely grateful. We recalled with gratitude all our partner agencies. The partnership with Missio- Aachen was more personal with the presence of two representatives who have encouraged us and opened new avenues of sharing our efforts towards the new way of being Church. We also thank our Asian bishops for supporting the AsIPA Desk of FABC Office of Laity that organized and gathered us together.